Renu in a snap! Renu is the smart line of decorative electrical products from Leviton. Install Renu and get a fresh stylish look, plus the ability to change the color of any Renu device when you update a room. The line includes switches, outlets, GFCIs, dimmers, and sleek, screwless wallplates available in 20 designer colors. The Renu face plate RKAA1 makes it a snap to change the color of Renu 15A USB Charger/Tamper-Resistant Receptacle/Outlet, without rewiring or needing an electrician. Just order a face plate in the color of your choice and follow the simple directions to replace the existing face with a new hue. Snap on a wallplate (sold separately), and you're done. Renu in a snap! Renu is the smart new line of decorative electrical products from Leviton. Install Renu and get a fresh stylish look, plus the ability to change the color of any Renu device when you update a room. The line includes switches, outlets, GFCIs, dimmers, and sleek, screwless wallplates available in 20 designer colors. The Renu face plate RKR15 makes it a snap to change the color of Renu 15A tamper-resistant outlets, without rewiring or needing an electrician. Just order a face plate in the color of your choice and follow the simple directions to replace the existing face with a new hue. Snap on a wallplate (sold separately), and you're done. 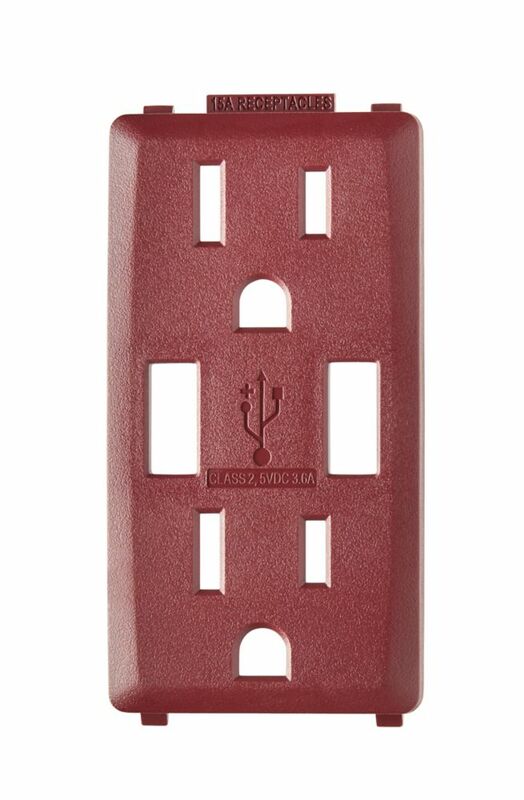 Face Plate for 3.6A USB Charger/15A Receptacle (Wallplate not Included) in Deep Garnet Renu in a snap! Renu is the smart line of decorative electrical products from Leviton. Install Renu and get a fresh stylish look, plus the ability to change the color of any Renu device when you update a room. The line includes switches, outlets, GFCIs, dimmers, and sleek, screwless wallplates available in 20 designer colors. The Renu face plate RKAA1 makes it a snap to change the color of Renu 15A USB Charger/Tamper-Resistant Receptacle/Outlet, without rewiring or needing an electrician. Just order a face plate in the color of your choice and follow the simple directions to replace the existing face with a new hue. Snap on a wallplate (sold separately), and you're done.